This fudge happened by accident. Back when I was perfecting my granola bar recipe, I decided to warm up the almond butter mixture for one of the test batches. When I stirred in the chocolate chips, they melted—as chocolate chips do when they’re stirred into warm liquids. Head smack. The chocolatey mix tasted great, but I cursed those chips for melting because I wasn’t trying to make solid chocolate bars. I couldn’t waste a precious blend of chocolate, honey and almond butter blends, however, so I carried on with the recipe and served it as a makeshift dessert at girls’ night. Jordan, Tessa and Alissa are always good sports. We all enjoyed the chocolatey bars that night, but I was still mad at them for not being what I wanted them to be. “Off you go!” I declared, and sent the rest home with Jordan. She texted me a couple of days later to tell me that she and her husband had polished off the whole batch already and she was craving more. She called it “salted oat fudge” and suggested I publish the recipe, so here we are! These delicious, easy, wholesome chocolate squares taste like a cross between fudge and no-bake cookies. 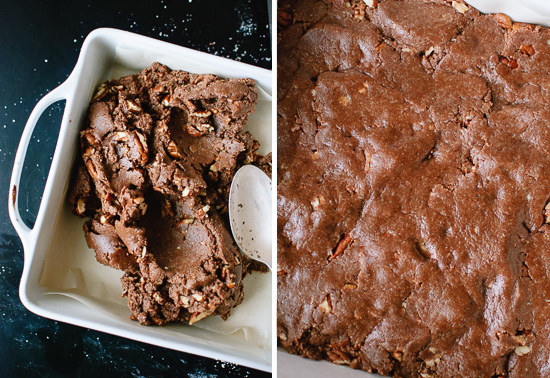 You just can’t go wrong with a hybrid between fudge and no-bake cookies, am I right? 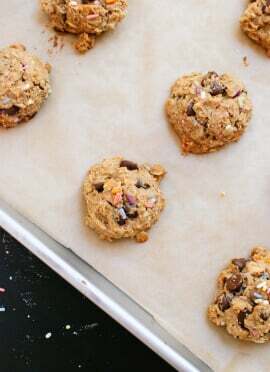 The version I’m sharing here uses oat flour instead of whole oats. 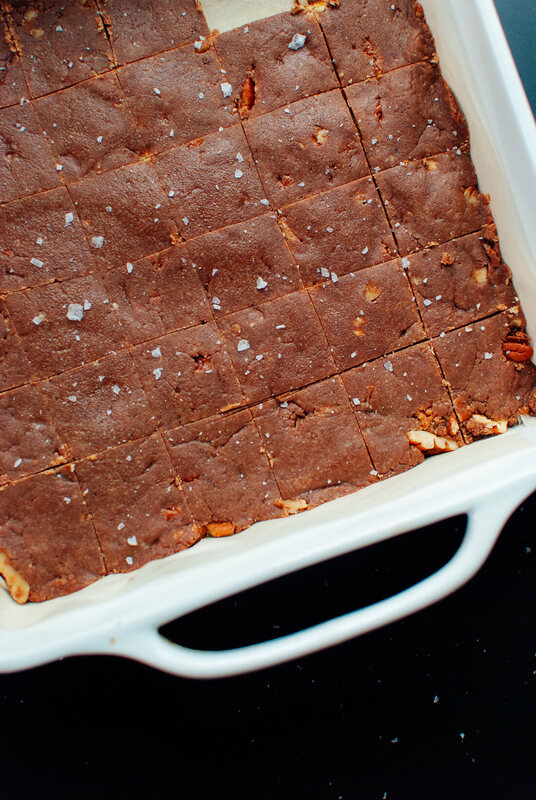 The oat flour disappears into the fudge and absorbs excess moisture so the bars are firm at room temperature. You can taste a subtle oaty-ness in the fudge, which I thoroughly enjoy. Feel free to play around with the fudge mix-ins; I made notes in the recipe to help you along. 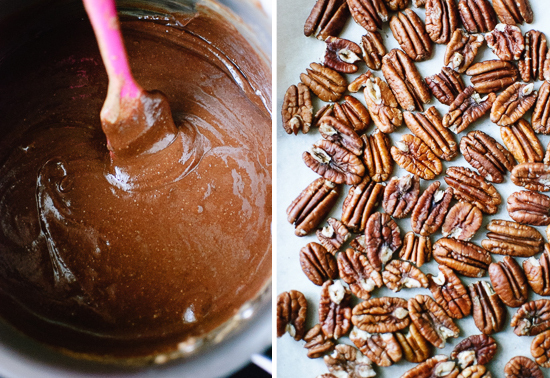 I added pecans and finished off the fudge with a sprinkle of flaky sea salt. Delicious! 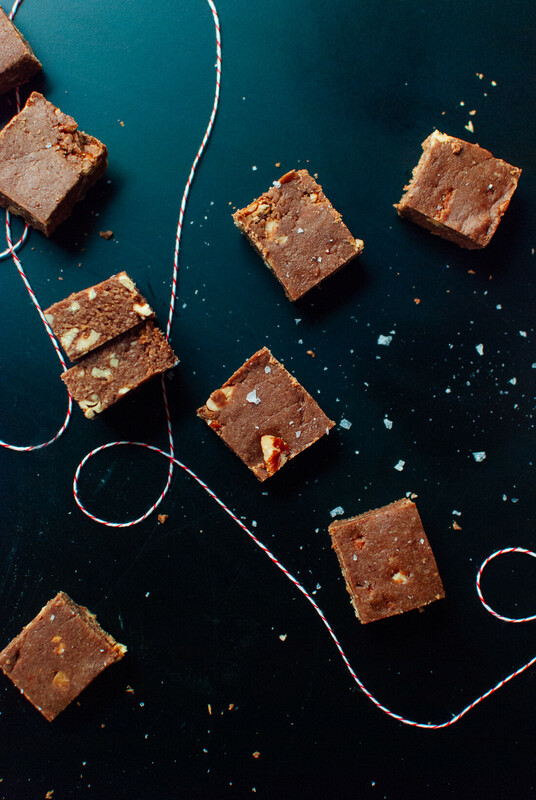 This delicious fudge recipe is healthier than most and lighter, too, thanks to oat flour! 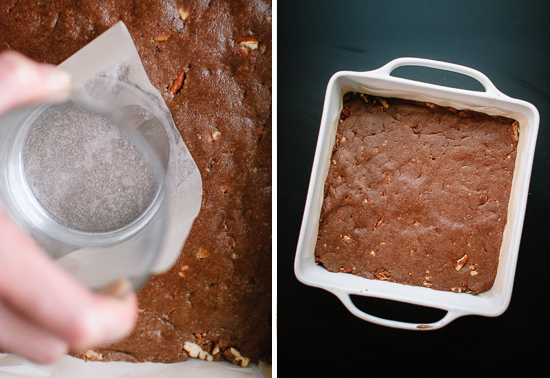 It tastes like a cross between fudge and no-bake cookies. Feel free to play with the mix-ins to suit your preferences. Toast the nuts: Arrange the nuts in a single layer on a small, rimmed baking sheet (I used parchment paper for easy clean-up). Bake for 7 to 10 minutes, until fragrant (7 minutes for thinner/smaller/chopped nuts and about 10 for whole pecans). If you’re using large nuts like pecans, transfer them to a cutting board and chop them into small pieces with a chef’s knife. Stir the vanilla extract into the pot, followed by the oat flour and finally, the chopped pecans. The mixture will have thickened up at this point, so you might have to put some muscle into it to mix in those pecans. You can do it! Carefully dump the fudge mixture into your lined square baker. Use the back of a sturdy mixing spoon to push the mixture across the baker so it’s roughly evenly distributed. Cover the bottom side of a thick, heavy-bottomed drinking glass or mason jar with parchment paper and press it down on the fudge repeatedly until the fudge is evenly packed. If you’re finishing the fudge with flaky sea salt, lightly sprinkle some on top now and gently press it into place with the bottom of your parchment-covered glass. Cover and freeze the fudge for 30 to 45 minutes, until it’s firm to the touch and no longer shiny in the middle. If you’re not in a hurry, you can refrigerate the fudge for a couple of hours or longer. Use a chef’s knife to slice the fudge into 1 ¼-inch wide columns and rows. Fudge will keep well for a couple of days at room temperature, or for a few weeks in the freezer, sealed in an air-tight freezer bag. Recipe adapted from my chocolate chip granola bars. 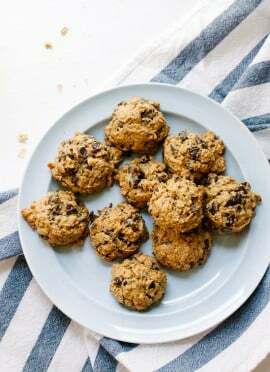 Make it dairy free and vegan: Use dairy-free chocolate chips and coconut oil in place of the butter. Make it gluten free: Use certified gluten-free oat flour or oats. 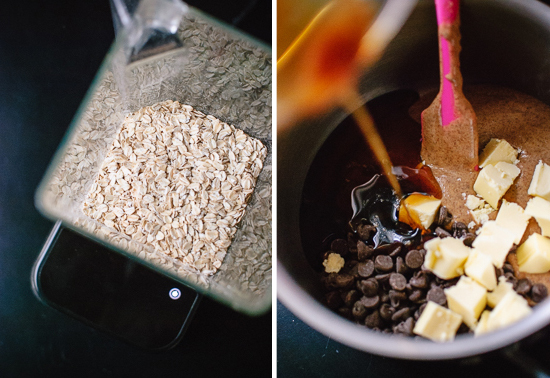 Change it up: If you want to include whole oats in the fudge for texture, use 1 ¼ cups old-fashioned oats and ¾ to 1 cup oat flour (add oat flour until you can hardly mix in any more). Need more holiday recipes? I got you covered over here. Delicious recipes that come about by mistakes are the best. That’s how the chocolate chip cookie came about, right? These look simple and delicious. Thanks for being willing to share, even if it was a mistake. Yum this sounds so good! Totally pinning right this minute! These look amazing! Since my jeans are still snug from the four batches of almond butter granola bars I made, I may wait until after the holidays to make these. But, I will make them. Thanks Kate! Wow, these look so so yummy! Made these today for a gift….not sure if they will make it out of the house, they are so good. I used walnuts in place of the pecans and it turned out really well. Thanks for another great recipe! Hooray! So glad to hear that Amanda, thanks for letting me know! That photo with Cookie’s face is so adorable and this salted oat fudge sounds amazing! This looks amazing! I’m literally about to walk into the kitchen and make this fudge right now! Thanks for the wonderful recipe, Kate! These look amazing! Do you think they would work with Buckwheat flour? I have celiac disease and cannot tolerate even gf oats :( BUT I love the mix of all the nuts and the chocolate! Hey Anna, I’m really sorry, I wish I knew if that would work! I’m doubtful because I don’t think buckwheat flour has the same absorptive properties as oat flour. Coconut flour just might work, but you’d probably need way less than the amount of oat flour called for here because it is a super absorber! I will let you know if I think of any other options. Looks Yummy. Did you use maple syrup when you made it? I want to use the same sweetener. Thank You. Hi Misty, yes, I used maple syrup in the fudge you see here. I also made a batch with honey. I didn’t notice any differences other than the subtle flavor differences that each provide. Enjoy! I love when recipes turn out accidentally awesome, especially fudge! I love when you include a picture with little Cookie in it, what a cutie! Some of the best things in life happen by accident. This fudge is definitely one of them. Looks so tasty! I made these last night for a dinner party. I added a pinch of cayenne pepper for some heat, and went for the recommended sprinkle of salt flakes on the top. They turned out excellently! Quick and delicious, I’ll be making these again for sure. Fantastic! Great idea to add some cayenne pepper. I like the way you think, Jill. Thanks for commenting! These came out great! A keeper recipe! This sounds SO good. I might make them for Christmas Neighbor Cookie Plates :) Thanks for sharing such an easy/yummy recipe! A happy accident- can’t wait to try them! I made these this afternoon and just had a piece and it was awesome!! I used coconut oil, 1/4 cup of maple syrup (I like my desserts less sweet) and used dark chocolate chips. I like how satisfying these were as well–the oats make it feel substantial and healthy :) and the chocolate and pecans make it feel indulgent! Hooray! Thanks, Emily! Your version sounds so delicious. Thanks, Emily! I was so set on granola bars that I didn’t recognize this fudge’s potential at first. Ha. I instantly thought of no-bake cookies when I saw the oat flour…what a nice mix-up to the fudge game! So it didn’t make sense that 1-3/4c oats would grind “up” to 2c oat flour and sure enough, it didn’t. It took 2-1/2c oats to grind “down” to 2c oat flour. That said, I suspect that I should have stuck with the flour from 1 3/4 cups because these are quite crumbly, certainly won’t stand up to being shipped or even kept at room temperature for a couple of hours on a cookie plate. Good flavor/texture/concept but the recipe could have used more detail … like grams. Lady K, I’m so sorry this fudge didn’t work for you. I try to add as much detail as I can to my recipes, but those must have just caused confusion this time. 1 3/4 cups oats should’ve done the trick. I’ll try to remedy the recipe now. Really loving this recipe! The oats and almond butter – yesss! Yeyaaah! LOOOVED these chocolatey morsels. Salted oat fudge is the perfect name for it! Hi Kate, I absolutely love this recipe and so did my husband. The bars lasted all of two days and he is already asking me to make them again. One thing we both noticed is that they were a bit crumbly and I was wondering why this might have occurred or if they just naturally are this way. I did sub out the almond butter for peanut butter and the pecans for half peanuts/half raisins, but followed the recipe otherwise. They are still incredible of course, just curious about the texture. Hi Leila! I’m sorry about the crumbly texture. Sounds like yours were more crumbly than mine. Did you pack down the fudge really, really well? That’s important. These look so good. If I were at home right now I would definitely make a trip to the store and make these right away! Well oat fudge sounds even BETTER than regular fudge! I mean, it must be healthy enough to eat for breakfast with all those oats! I will definitely be making these as a Christmas treat! Love the more wholesome approach to fudge. I have a bag of oat flour I’d like to use instead of grinding oats. How much flour do I need (i.e., how much flour does the 1.75 cups of oats make)? Thanks! Hey Kate, I’m so sorry I didn’t answer your question soon. It’s hard to say on the oat flour and I wish I had a for sure answer for you. I think you’d be safe with 1 3/4 cups oat flour. Mix in a little more if it still seems goopy. Yum! Made these today for a Christmas party and what a hit! So many folks asked for this recipe so I gladly shared your blog with them. I’ll make another batch tomorrow for family get together. I used bittersweet chocolate chips which worked out fine. I also used the 1 and 3/4 cups of oatmeal, then ground it in food processor..I did not remeasure it. Thank you so much for delicious and healthy recipes! Have a wonderful holiday Kate! Deborah, I’m so glad you all enjoyed the fudge! Thank you for sharing my blog with your friends. I really appreciate it. These are fantastic and I don’the feel weighed down after having a few squares. I like to cut them into mini squares and left the nuts out so my kids would love like them too. With dairy/soy free dark chocolate and oat flour these are keepers. I had never made fudge and it was so easy. Happy holidays Kate! Oh, I’m so glad! Thanks, Kelly! I used to make fudge with my grandmother and it was pretty tricky. This oat kind is way easier. I was thinking it was probably time to put an end to the holiday eating…but I’ll have to extend it a few more days so I can make this ;) You need a treat on New Years anyways, right?! Thanks for another gem! Kate! Oh mah gah, I can’t get over this stuff. I talked my mom into making it for the holidays and can’t stop eating it, I am in love! The texture is so pleasing, nut butter subtle, consistency perfect, and sweetness just right. My mom loves it too. THANK YOU! Yum Kate! I love these so much. All I had was salty peanut butter, so they are VERY salty, which turned out perfectly for me. The oat flour was such a great idea! Thank you for sharing! Hi Kate, love your stuff. Do you think this would work if i subbed in shredded coconut in place of nuts? I’d like to make this nut-free for my son’s bestie who is anaphylactic. Thanks! Hi Lisa! I’m afraid this recipe might not work for your son’s friend since it calls for nut butter in addition to the nuts. You could probably use coconut butter in place of the nut butter and omit the nuts, if you want to give that a shot, but I have not tried. I made these into little balls and then rolled them in coconut… oh my goodness, I just can’t get enough of them! They are so delicious and it’s like breakfast all rolled up together :) Thanks for posting your “mistake” recipe! What a great idea! Thanks for sharing, Jeanette! I was craving chocolate so I made a batch of these and they’re so good! I used organic peanut butter and carob chips. Also added cayenne because I love a little heat! The whole family loved them too! Thanks, Amber! Love that you added cayenne for some kick! Kate, this fudge was spectacular! I had to use some Speculoos as well because I ran out of peanut butter but it was still great. Thank you! Thanks, Gayatri! Glad you enjoyed it! Speculoos sounds like a most excellent addition. These are terrific, and fun to make. I’ve probably made 4 batches in the past month, different variations, all successful. Just added sunflower seeds and dried cranberries to my latest batch. Was at a Christmas party the other day and someone else made hers with almond butter and toasted almonds. So glad I found this – thanks, Kate. Definite keeper. Made this recipe as part of a food gift pkg for my elderly father..yum! and healthy.. Not so sugary as fudge is and much more protein thanks for the recipe! Will it melt if I pack and send to my brother during summer? This really is too easy and delicious! I just made this recipe, but I used organic/unsalted cashew butter and cashew nuts. That’s what I had on hand, so we’ll see how it turns out (once it’s ready to be eaten)! I’ve never made fudge before. I’m wondering if this will be freezable as I will not be able to eat all of it! Hey! I have just discovered your page and love it. Was considering taking part in Sugar Free February and looking at some things I can make to get a nice sweet hit without using refined sugar. Wondering how the choc chips fit into this and what i could substitute in (maybe cacao chips?) Thanks! Hi Nolene! I’ve heard good things about the challenge. I’ve never worked with cacao chips so I’m really not sure. This recipe is pretty dependent upon the chocolate chips for structure. You might have better luck with this peanut butter fudge. 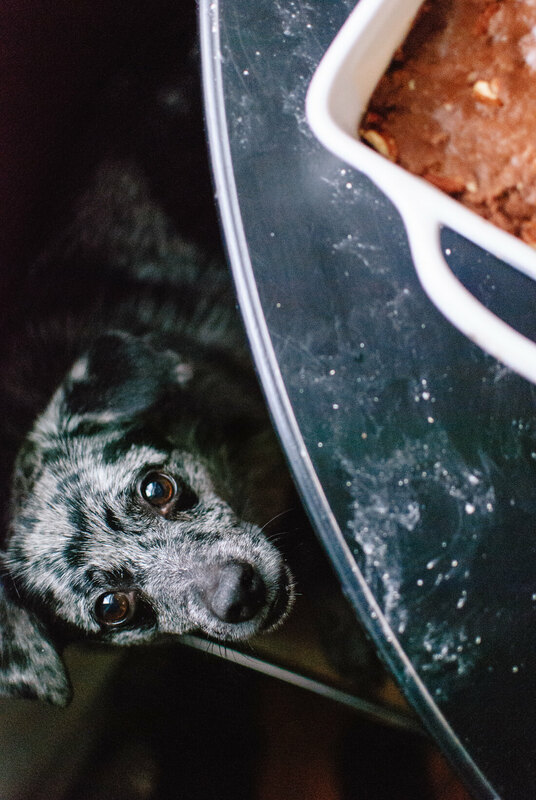 I am a private chef for a acupuncturist…also my best friend. Yum! I used peanut butter and found that this tastes a lot like an eat more bar. Chewy and salty. Love that there is oaty goodness in here. First dessert recipe of yours I have tried. The hardest part was cutting the bars after refrigeration, the easy part was eating them. I was apprehensive about the oat flour (I made my own with a Vitamix). I used coconut oil, maple syrup, and pecans and it came out great. Just made these – one word review – DELICIOUS!!!! So incredibly yummy and very easy to make. I added a 1/2 cup of shredded coconut and a sprinkle of bee pollen pressed on top with the salt. These will be a staple in the freezer from now on! why not keep the oats whole? Esp. if you use the quick-cooking variety, it seems they’d be fine. Or would the mixture not hold together as well? Hi Marya! Great question. You really want this to act almost like a flour so it will bind correctly. Does that make sense? 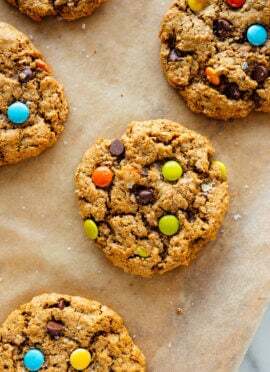 Blending the oats and using oat flour will get you the result you want. I hope this helps! I cannot tell you how many times I have made this fudge! It has seriously become my Sunday routine to make this for my mom because she has a bit of an obsession with it! I’m glad you love it, Heather! Thanks so much for the review.